Was the .375 H&H enough gun for this nasty moggie? David Hughes goes DIY for a big buff bull. Lurching slowly across the wide floodplain in the Toyota Hilux, a big lump of buffalo bull appeared out of nowhere, trotting along to our left. He was a couple of hundred metres from us, and heading roughly parallel to our line of travel toward the fringing forest a bit less than a kilometre away. My brother Neale was at the wheel and gave chase - such as we could without wrecking the vehicle. The surface of the floodplain was heavily pockmarked from ponderous buffalo feet and wallowing during the wet season. The cratering had baked rock-hard under the relentless Arnhem Land sun. With much bouncing-around, we got within a hundred metres or so when I called Neale to stop. I jumped from the vehicle to take a rest on a handy termite mound. I had a round up the spout of my .375H&H Magnum in a trice and drew bead on the trotting bull. The wallop of the 270 grain Barnes TSX bullet hitting home could be clearly heard. This pulled him up immediately, enabling a couple more finishing shots into the vitals, which had him wobbling, then teetering-over onto the deck. Approaching on foot I was conscious of the massive size of the animal and the possibility that it might summon enough energy for a final charge. Just as insurance, I elected to put a final shot through its head from close range. Although not exactly a classic stalk, I was one very happy hunter to have a decent bull on the deck on the first hunting day of our DIY NT safari. Neale emerging from our trusty hire vehicle to check out the bovines in the area. We’d arranged self-guided access to a huge station which was supposed to harbour heaps of buffalo. A few years before I had paid ‘top dollar’ to cull ten buffalo cows in eastern Arnhem Land. On that occasion my hunting mate had outlaid over eight grand for the pleasure of taking a bull. A quick web surf confirmed that stratospheric prices still prevailed for the average buffalo hunt. I readily found three local outfitters advertising for two-on-one guided trophy bull hunts priced from $9,500 to over $11,000 for each hunter. This time around I hoped to take my first bull on a much more economical basis. Our arrangement with the owner was simple - $1,000 per bull, and the rest was up to us. Neale and I had flown into Darwin three days before and checked into the airport hotel, where we planned to stay overnight while arranging our transport and supplies. We’d hired a Toyota Hilux fitted-out to mining specifications and able to be driven anywhere (OAQ4X4, www.oaqhire.com.au). Finding these vehicles was a huge boon, as all the major hire car companies did not allow off-road use. The hire rate was only $88 per day, which seemed pretty cheap to me. Since we would be bashing about in unknown territory we thought it sensible to reduce the insurance excess to $500/day, which set us back a further $15/day. A quiet scrutiny of this waterhole revealed the presence of a buffalo cow and calf but nothing in the bull department. Another key element to our DIY provisioning was the generous loan by some locals of a heap of camp kit, which would make the difference between survival and reasonable comfort. Neale’s mates came good with a generator, Engel fridge, BBQ, camp chairs, table and miscellaneous other bits and pieces which would make life bearable over a week in the most remote conditions imaginable in the Territory. The Woolies cash-register display lit up with $327.89 as the total bill for our carefully itemised list of tucker. Since the nearest store would be several hours drive away we made sure our week in the bush was well provisioned. We’d developed a planning spreadsheet with daily camp meals and field snacks all worked-out. If we ran short we’d be eating a lot of buffalo! With seven full days planned in the field, and in anticipation of a lot of low-speed driving over rough country, we’d spent some time estimating the volume of diesel we’d need to carry. We topped-up at the roadhouse nearest the station, and with a couple of jerry cans of extra fuel on board, we reckoned we could do a fair amount of driving per day without risk of running out before returning to civilisation. We also carried a jerry of regular juice for the generator. The drive from the homestead to camp was long, rough and slow. Once into the floodplain country we started to see buffalo here and there, sheltering in the scanty shade of the sparse tree cover. The larger groups were invariably cows and calves. A few young bulls aroused more interest, as did a large solitary bull way out in the middle of a grassy plain. However, with the sun westering, and without having found a camping spot, we elected not to leave the vague track we were following. Next day saw us well-settled into a nice camp beside a shrinking waterhole in a sandy creek bed. From there we could commence our explorations of the surrounding territory. The floodplains generally could be navigated in the Hilux, albeit very slowly. Dry watercourses and gullies halted progress, as did the rough, rocky ridges that flanked the floodplains. Most days we saw 30-100 animals, but very few were bulls. It was a case of spending a lot of time exploring the countryside and glassing it thoroughly. Every so often we’d spy a bull, and sometimes would approach on foot to better assess the size of its headgear. On the second day we encountered an excellent bull planted right in the middle of a grassy plain keeping its own company. There were just two trees between our vehicle and the bull, but after a well-executed 400 metre stalk I had closed the range to about 150m and had the luxury of a good rest in the fork of the last tree. With no excuses for a bad shot, I lobbed a 270gn Barnes TSX right in the boiler room. The bull didn’t run and looked pretty wobbly, but I needed several more shots before he went down. The adrenalin was pumping as I walked up to the fallen beast. Fearful of a last desperation charge I put an ‘insurance shot’ into the spine and a coup de grace through the head. I was over the moon with the outcome of the stalk and couldn’t have realistically hoped for a better set of horns, which measured about 32 inches in length and 18 inches around the bases. Over the next few days, we scoured the area both on-foot and in the vehicle for a bull superior to the pair that I’d already dropped. The effort was in vain, but we saw some awesome landscapes and interesting wildlife, including jabiru storks, brolgas and lots of freshwater crocs in some waterholes. The adverse impact of feral herbivores on the environment was very evident everywhere. You hear people refer to the vast expanses of Arnhem Land as being ‘pristine wilderness’. Unfortunately the reality is very different. Well over a century of exposure to buffalo, cattle and pigs has drastically affected the vegetation and the chances of survival of the native creatures relying on it for refuge. The combined impact of feral animals with altered fire regimes post-colonisation has been catastrophic on the small mammal populations. Removal of feral herbivores, in combination with a return to cooler season ‘mosaic-burn’ fire regimes, has shown environmental recovery on a large scale in the tropical north (http://www.australianwildlife.org/media/17529/AWC-Wildlife-Matters-Spring-2013.pdf). By helping reduce the number of damaging ferals, hunting definitely has a place in effective environmental management programs. With the Hilux humming along the highway back toward Darwin, I reflected that our DIY efforts couldn’t have worked-out better. At a cost representing a fraction of a guided hunt, I’d anchored a couple of fair dinkum trophy bulls. All-up, my hunting fund had taken a hit of under two grand for expenses plus another two grand for trophy fees. The return airfare was $463 and my half of the shared bills represented $164 for the supermarket, $515 for the Toyota, diesel about $250 and the Darwin hotel about $100. Meals and drinks on the way in and back probably added another $100. So the total exposure was about $1,600 in expenses plus $1,000 each for the two bulls – probably a third of what I would have had to shell-out for the fully guided equivalent. To top it off, the overall adventure rated right near the top of all my hunting expeditions. The terrain was vast and remote, and we had been totally reliant on our own resources. We had worked hard to understand the habits of our quarry, and had enjoyed the satisfaction of successfully seeking it out. The comradeship around the evening campfire after taxing days in the heat reinforced our hunting spirits. The skull mounts on the walls of my man-cave will remind me of the DIY buff hunt when I am too old to venture into the field - perhaps the stories behind my memorabilia will fire-up my grandchildren to seek out wild places and wild critters, and keep alive their hunting instincts. 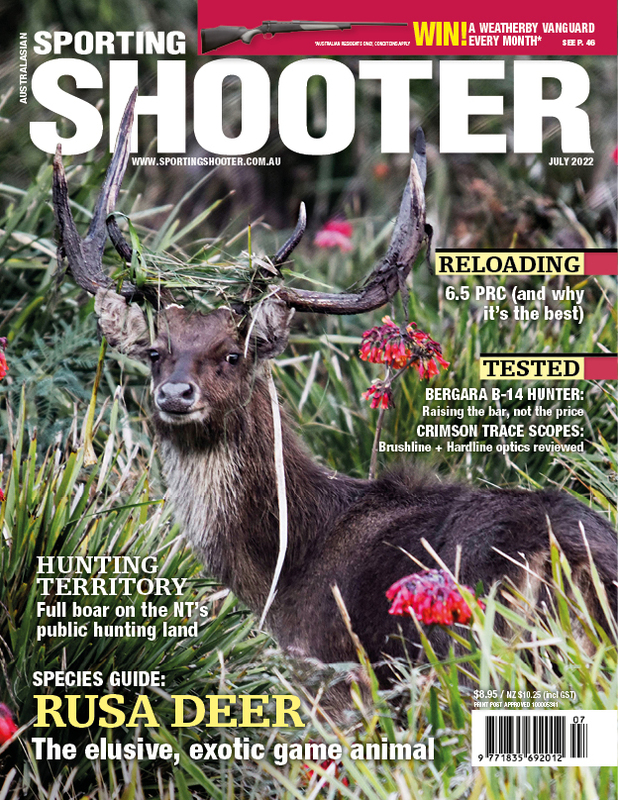 Sporting Shooter magazine is for those who love the outdoors and the thrill of the hunt. 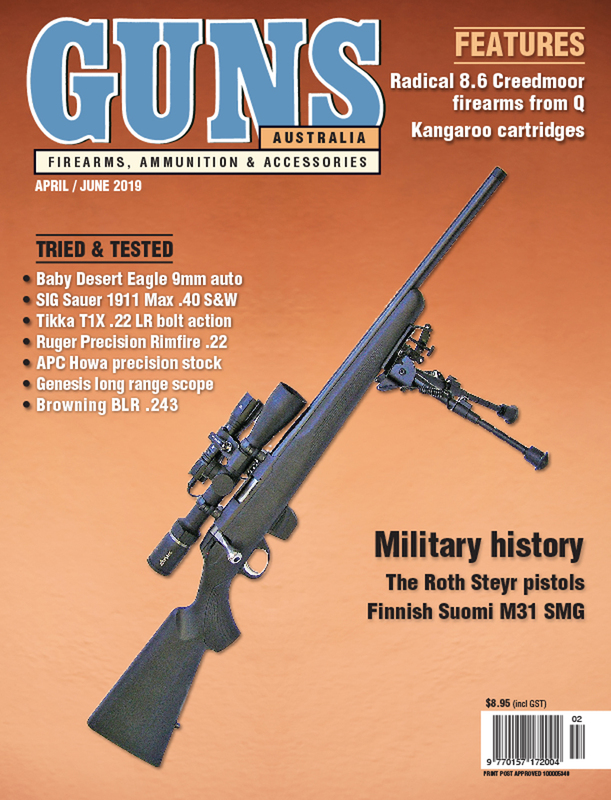 Each issue of Guns has a balance of articles on rifles, shotguns, handguns and military small arms plus historical features that are written by experts in their respective areas of interest. 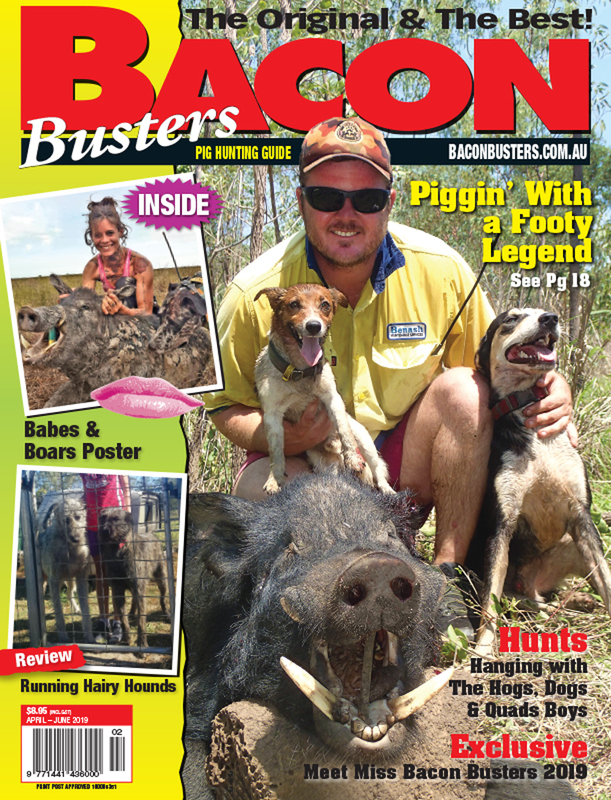 Australia's first and best magazine dedicated to pig hunting, Bacon Busters is an icon on the hog-hunting scene in this country.